In my conference room, over the years, I have heard sober predictions that a company or bank might fail if we indict, that innocent employees could lose their jobs, that entire industries may be affected, and even that global markets will feel the effects….And, in some cases, the health of an industry or the markets are a real factor. Those are the kinds of considerations in white collar crime cases that literally keep me up at night, and which must play a role in responsible enforcement. Breuer’s remarks elicited a firestorm of criticism. Yet state treasurers and public pension funds are similarly, and vastly more openly, unduly solicitous about the health of the foxes than the chickens in their henhouses, yet their arguments are peculiarly given a free pass. David Sirota at the International Business Times followed up on a new instance of Wall Street sycophancy in action, that of a failed Freedom of Information request by the Providence Journal to obtain more information about hedge funds. A consultant, Cliffwater, had prepared due diligence reports on 19 hedge funds and presented them to the State Investment Committee meeting. The bone of contention is that under state law, documents presented in open sessions are public. But even this sort of discussion obscures far more important issues. Raimondo agues vigorously that Rhode Island needed (stress needed) to invest in the “asset class” of hedge funds in order to be sufficiently diversified and meet its fiduciary duty. The unstated but clearly implied rationale is that investing in hedge funds is essential, either to meet return requirement (as in hedge funds out-perform other strategies) or they constitute an “asset class and hence must be have some funds allocated to them. Note that a large body of academic literature has found that investing in more asset classes does not increase returns, but does reduce risk. However, hedge funds in recent years have struggled to meet stock market returns, raising doubt about their allure of outperformance. In addition, most scholarly work on asset classes in very broad terms (such stocks versus bonds versus cash versus foreign stocks versus real estate) that it is hard to see see a compensation strategy (aka the prototypical hedge fund 2% annual fee an 20% upside fee) amounting to being an asset class. Moreover, as we saw in the crisis, formerly weakly correlated investments moved together when markets got rocky and investors ran from risk. 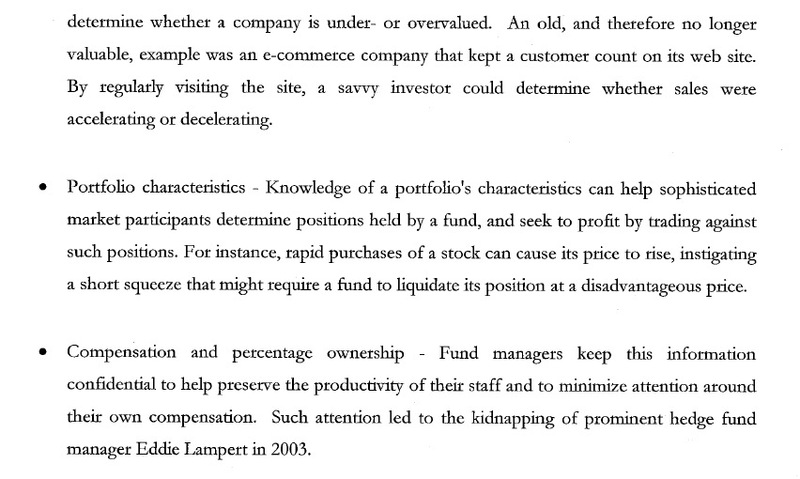 In other words, Raimundo’s claim that hedge funds are an indispensable investment don’t hold up to scrutiny, particularly when you consider that a recent study found that investing in a mix of 5 Vanguard funds would produce better returns than those realized by 90% of public pension funds. In addition, recall that the Providence Journal sought redacted information from several fund consultant reports. Riamundo maintains, vigorously, that access to this sort of insight, from firms that allegedly can provide superior insight by virtue of the consultant receiving confidential information from the hedge funds themselves, is crucial for Rhode Island to be able to make sound investments. But anyone with an ounce of objectivity knows that the reliance on these gatekeepers is much more an exercise in liability avoidance than return maximization. The very fact that the SEC found widespread shortcomings in contractual protections for investors and in oversight mechanisms in private equity funds is as much an indictment of these gatekeepers as of the limited partners. The Providence Journal reports that the move has generated roughly $70 million in fees for the financial industry — the same industry that has made major contributions to Raimondo’s political campaigns. According to GoLocalProv, documents from the Treasurer’s office show that before Raimondo took office, Rhode Island “investment fees were among the lowest of any state pension fund in the country,” but that “under Raimondo, the cost of investment fees has nearly tripled.” A union-financed investigation estimated that fees have increased almost 700 percent in recent years. Still, the confluence of new investments, increased fees, below-average returns for Rhode Island taxpayers and Wall Street campaign contributions inevitably raised questions. Seeking to investigate the pension investment shift initiated by Raimondo, the Providence Journal in April of 2013 asked Rhode Island’s government to release details of deals between the state’s public pension system and major financial firms. Raimondo’s office denied the request. California’s $301 billion pension system, the largest in the nation, has been the target of an open records lawsuit by Naked Capitalism’s Susan Webber (who writes under the name Yves Smith). She filed her suit after CalPERS officials did not respond to her request for detailed fund performance data…. - Pennsylvania officials scrambled to re-hide state pension contracts with major financial firms after Webber republished 12 agreements she discovered posted on the State Treasury’s website. Pennsylvania officials told the Philadelphia Inquirer that as a matter of policy, the Pennsylvania State Employees Retirement System “ceased posting alternative investment contracts that reveal the terms” of agreements between the state and financial firms. The Inquirer noted that Pennsylvania Treasurer Rob McCord, “who used to run a money management firm that ran state pension money [said] the treasurer won’t stop PSERS from suppressing” the documents. According to Montgomery County Commissioner Joshua Shapiro (D), Pennsylvania’s pension system pays roughly $770 million a year in financial management fees. In the Pennsylvania leak, Webber discovered what she says are provisions outlining a tax dodge technique that may face Internal Revenue Service scrutiny. But even though more and more reporters are mounting more assaults against alternative investment secrecy, no one has yet breeched the wall. And until the public realizes that it pays, though higher taxes or reduced services when public pensions come up short as a result of poor investment selection, the chicanery is sure to continue. When the central bank pumps money into the economy and suppresses interest rates it creates incentives to speculate and invest in ways that would not otherwise be viable. At a superficial level the central bank's strategy will often seem valid, because the increased speculating and investing prompted by the monetary stimulus will temporarily boost economic activity and could lead to lower unemployment. The problem is that the diversion of resources into projects and other investments that are only justified by the stream of new money and artificially low interest rates will destroy wealth at the same time as it is boosting activity. In effect, the central bank's efforts cause the economy to feast on its seed corn, temporarily creating full bellies while setting the stage for severe hunger in the future. We witnessed a classic example of the above-described phenomenon during 2001-2009, when aggressive monetary stimulus introduced by the US Federal Reserve to mitigate the fallout from the bursting of the NASDAQ bubble and "911" led to booms in US real estate and real-estate-related industries/investments. For a few years, the massive diversion of resources into real-estate projects and debt created the outward appearance of a strong economy, but a reduction in the rate of money-pumping eventually exposed the wastage and left millions of people unemployed or under-employed. The point is that the collapse of 2007-2009 would never have happened if the Fed hadn't subjected the economy to a flood of new money and artificially-low interest rates during 2001-2005. 1) The suppression of interest rates has prompted a scramble for yield, which has pushed yields on higher-risk bonds down relative to yields on lower-risk bonds. The bonds issued by the governments of Spain and Italy now yield only slightly more than US Treasury Notes, the yields on investment-grade corporate bonds are now roughly the same as the yields on equivalent government bonds, and the yields on junk bonds are generally much lower than normal relative to the yields on investment-grade corporate bonds. This tells us that monetary accommodation has greatly increased the general appetite for risky investments, which is always a prelude to substantial losses. 2) Public companies have been buying back equity at a record pace, despite high equity valuations. One reason is that although equity valuations are high, debt is generally priced even higher. Regardless of how expensive a company's stock happens to be, from a financial-engineering perspective it can make sense for the company to borrow money to repurchase its own stock as long as the interest rate on its debt is lower than its earnings yield. Buying back stock boosts per-share earnings and often increases bonus payments to management, but it does nothing to expand or improve the underlying business. 3) The number of unprofitable IPOs during the first half of this year was the highest since the first half of 2000. What a waste. 4) The latest boom has been so obviously reliant on the Fed's easy money that the real economy's response has been far less vigorous than usual. This at least partly explains the reticence of corporate America to devote money to capital expenditure designed to grow the business and, instead, to focus on financial engineering designed to give per-share earnings a boost. IBM provides us with an excellent example. As David Stockman points out in a recent blog post, since 2004 IBM has generated $131B of net income, spent $124B buying-back its own stock and devoted $45B to capital expenditure. IBM has therefore been channeling almost all of its earnings into stock buy-backs and has bought back almost $3 of its own stock for every $1 of capex. Furthermore, 90% of the capex was to cover depreciation and amortisation. No wonder IBM has just reported declining year-over-year revenue for the 9th quarter in succession. If interest rates were at more realistic levels there would be less incentive to buy back stock and more incentive to invest in ways to increase productivity. 5) Thanks to the combination of government support, low interest rates and a flood of new money, some large, poorly-run companies are staggering around like zombies, consuming resources that could have been used more productively. General Motors is a prime example. 6) On an economy-wide basis there has been no deleveraging in the US. This is evidenced by the following chart. Instead, the Fed's promotion of leveraged speculation and the government's deficit-spending maintained the steep upward trend in economy-wide credit. Consequently, in terms of total debt the US economy is in a more precarious position today than it was in 2007. It will therefore not be possible for interest rates to normalise without precipitating an economic collapse. 7) The abundance of cheap credit prompted hedge funds and private equity firms to buy more than 200,000 US houses, which in many cases are now being rented to people who lost their homes when the previous Fed-promoted boom turned to bust. This has boosted house prices and created the false impression that the residential real-estate market is immersed in a sustainable recovery, prompting new (mal-) investments in this market. 8) The strength in auto sales is linked to the ready availability of subprime credit, which, in turn, is an effect of central-banking largesse, making it likely that auto sales will tank within the next two years. This will not only affect the assemblers of cars and the manufacturers of the components that go into cars, but will also affect all the industries that are involved in the shipping, storage, selling and financing of new cars. 9) While there is no doubt that the shale oil-and-gas industry would have been a great success story without the flood of cheap credit engineered by the Fed, the flood of cheap credit has led to a massive increase in the industry's debt-to-revenue ratio that has probably made the economics of shale-oil production look better than is actually the case and made the industry acutely vulnerable to tighter monetary conditions. Consequently, despite its solid economic foundation there will probably be many bankruptcies within this industry over the next few years. A final point is that just as you never really know who has been swimming naked until after the tide goes out, you will never be able to identify all the mal-investments until after the monetary stimulus comes to an end. Why is Financial Stability Essential for Key Currencies in the International Monetary System? Could the dollar lose its status as the key international currency for international trade and international financial transactions, and if so, what would be the principal contributing factors? Speculation about this issue has long been abundant, and views diverse. After the introduction of the euro, there was much public debate about the euro displacing the dollar (Frankel 2008). The monitoring and analysis included in the ECB’s reports on “The International Role of the Euro” (e.g. ECB 2013) show that the international use of the euro mainly progressed in the years prior to 2004, and that it has largely stalled since then. More recently, the euro has been displaced by the renminbi as the debate’s main contender for reducing the international role of the dollar (Frankel 2011). This debate has mainly argued in terms of ‘traditional’ determinants of international currency status, such as country size, economic stability, openness to trade and capital flows, and the depth and liquidity of financial markets (Portes and Rey 1998). Considerations regarding the strength of country institutions have more recently been added to the list. All of these factors influence the ability of currencies to function as stores of value, to support liquidity, and to be accepted for international payments. Inertia also plays a role (e.g. Krugman 1984, Goldberg 2010), raising the bar for currencies that might uproot the status quo. We argue here – building on discussions we began during the World Economic Forum Summit on the Global Agenda 2013 – that the rise in global financial-market integration implies an even broader set of drivers of the future roles of international currencies. In particular, we maintain that the set of drivers should include the institutional and regulatory frameworks for financial stability. The emphasis on financial stability is linked with the expanded awareness of governments and international investors of the importance of safety and liquidity of related reserve assets. For a currency to have international reserve status, the related assets must be useable with minimal transaction-price impact, and have relatively stable values in times of stress. If the risk of banking stress or failures is substantial, and the potential fiscal consequences are sizeable, the safety of sovereign assets is compromised exactly at times of financial stress, through the contingent fiscal liabilities related to systemic banking crises. Monies with reserve-currency status therefore need to be ones with low probabilities of twin sovereign and financial crises. Financial stability reforms can – alongside fiscal prudence – help protect the safety and liquidity of sovereign assets, and can hence play a crucial role for reserve-currency status. The broader emphasis on financial stability also derives indirectly from the expanded awareness in the international community of the occasionally disruptive international spillovers of centre-country funding shocks (Rey 2013). We argue that regulatory reforms can play a role in influencing these spillovers. Resilience-enhancing financial regulation of global banks can help reduce the volatility of capital flows that are intermediated through such banks. International reserve assets tend to be provided by sovereigns, notably due to the fiscal capacity of the state and the credibility of the lender of last resort function of the central bank during liquidity crises (see also De Grauwe 2011 and Gourinchas and Jeanne 2012). Systemic financial events can be accompanied by pressures on the government budget, however. While provision of a fiscal backstop to the banking sector is not the best ex ante approach to policy, fiscal support will tend to be forthcoming if the risk and estimated welfare costs of a systemic fallout are otherwise deemed too high. Yet, banking sector risks – and inadequate capacity within the banking sector to absorb these risks – can end up exceeding a government’s ability to provide a credible fiscal backstop without adversely affecting the safety of its sovereign assets. The fiscal consequences of bailouts may result in increased sovereign risk and the loss of safe-asset status, with implications for the status of the currency in question in the international monetary system. To increase the likelihood that sovereign assets remain safe during systemic events, the sovereign can undertake financial and fiscal reforms that decouple the fiscal state of the sovereign from banking crises. Such reforms should achieve, in part, a reduction in the likelihood of and need for bailouts through increased resilience and loss absorption capacity of the financial system, and by ensuring sufficient fiscal space for credible financial-sector support (see also Obstfeld 2013). Recovery and resolution regimes for distressed systemically important financial institutions (SIFIs) are being improved. Importantly, initiatives are underway to improve recovery and resolution in the international context. While a global agreement on cross-border bank resolution is currently not in place, bilateral agreements among some pairs of countries are being forged ex ante to facilitate lower-cost resolution ex post. The foreign-currency swap arrangements among central banks to provide access to foreign-currency funding liquidity at times when market prices of such liquidity are punishingly high. Nevertheless, the financial system contains vulnerabilities – globally, as well as in individual currency areas. The negative sovereign-banking feedback loop may be weakened in many countries, but has not been fully severed. Moreover, reforms are not necessarily evenly implemented across countries. Fiscal capacities to provide credible backstops of the financial sector during stress vary widely. The consequences of recent reforms for the future of key international currencies are therefore open. Scope remains for countries vying for reserve-currency status to use the tool of financial stability reform to protect the safety and liquidity of their sovereign assets from the contingent liabilities of financial systemic risk. International capital flows yield many advantages to home and host countries alike. Yet the international monetary system still faces potential challenges stemming from unanticipated volatility in flows, as well as occasionally disruptive spillovers of shocks in centre-country funding conditions to the periphery. With the events around the collapse of Lehman Brothers, disruption in dollar-denominated wholesale funding markets led to retrenchment of international lending activities. Capital flows to some emerging-market economies then recovered with a vengeance as investors searched for yield outside the countries central to the international monetary system, where interest rates were maintained at the zero lower bound. After emerging markets were buoyed by the influx of funds, outflows and repositioning occurred when markets viewed some of the expansionary policies in the US as more likely to be unwound. While macroprudential measures – and in extreme cases, capital controls – are some of the policy options available for addressing the currently intrinsic vulnerabilities of some capital-flow recipient periphery countries (IMF 2012), we point out that these vulnerabilities can also be addressed in part by financial stability reforms in centre countries. Consider, for example, the consequences of the regulatory reforms pertaining to international banks that are currently being proposed or implemented. Improvements in the underlying financial strength and loss-absorbing capacity of global banks could have the beneficial side-effect of reducing some of the negative spillovers associated with unanticipated volatility in international banking flows – especially those to emerging and developing economies. Empirical research suggests that better-capitalised financial institutions, and institutions with more stable funding sources and stronger liquidity management, adjust their balance sheets to a lesser degree when funding conditions tighten (Gambacorta and Mistrulli 2004, Kaplan and Minoiu 2013). The result extends to cross-border bank lending (Cetorelli and Goldberg 2011, Bruno and Shin 2013). While financial stability reforms may reduce the externalities of centre-country funding conditions, they retain the features of international banking that promote efficient allocation of capital, risk sharing, and effective financial intermediation. By enhancing the stability of global institutions and reducing some of the amplitude of the volatility of international capital flows, they may address some of the objections to the destabilising features of the current system. Cross-border capital flows that take place outside of the global banking system have recently increased relative to banking flows (Shin 2013). Regulation of global banks does very little to address such flows, and may even push more flows toward the unregulated sector. At the same time, however, regulators are considering non-bank and non-insurer financial institutions as potential global systemically important financial institutions (Financial Stability Board 2014). We have argued that the policy and institutional frameworks for financial stability are important new determinants of the relative roles of currencies in the international monetary system. Financial stability reform enhances the safety of reserve assets, and may contribute indirectly to the stability of international capital flows. Of course, the ‘old’ drivers of reserve currencies continue to be influential. China’s progress in liberalising its capital account, and structural reforms to generate medium-term growth in the Eurozone – as examples of determinants of the future international roles of the renminbi and the euro relative to the US dollar – will continue to influence their international currency status. Our point is that such reforms will not be enough. The progress achieved on financial stability reforms in major currency areas will also greatly influence the future roles of their currencies. John Hussman: "Make No Mistake - This Is An Equity Bubble, And A Highly Advanced One"
In case someone needs a beyond idiotic op-ed on the state of the market, we urge them to read the following stunner from USA Today (which is simply a syndicated piece from the Motley Fool, complete with Batman style graphics). Beyond idiotic because in addition to quoting the perpetually amusing Stony Brook assistant professor, Noah Smith, who has never held a job outside of academia and is thus a credible source on all things markety (to wit: "The value of a financial asset is the discounted present value of its future payoffs, and when the discount rate -- of which the Fed interest rate is a component -- goes down, the true fundamental value of risky assets goes up mechanically and automatically. That's rational price appreciation, not a bubble." And by that logic under NIRP the value of an asset is... what? +??) it says this: "Stock prices correct all the time. But what's important to remember is that a correction isn't a bubble." Yes, a correction is not a bubble: it is the result of one, and usually transforms into something far worse once the bubble pops. Entertaining propaganda aside, for some actually astute observations on the state of the market bubble we go to John Hussman, someone whose opinion on such issues does matter. Make no mistake – this is an equity bubble, and a highly advanced one. On the most historically reliable measures, it is easily beyond 1972 and 1987, beyond 1929 and 2007, and is now within about 15% of the 2000 extreme. The main difference between the current episode and that of 2000 is that the 2000 bubble was strikingly obvious in technology, whereas the present one is diffused across all sectors in a way that makes valuations for most stocks actually worse than in 2000. The median price/revenue ratio of S&P 500 components is already far above the 2000 level, and the average across S&P 500 components is nearly the same as in 2000. The extent of this bubble is also partially obscured by record high profit margins that make P/E ratios on single-year measures seem less extreme (though the forward operating P/E of the S&P 500 is already beyond its 2007 peak even without accounting for margins). Recall also that the ratio of nonfinancial market capitalization to GDP is presently about 1.35, versus a pre-bubble historical norm of about 0.55 and an extreme at the 2000 peak of 1.54. This measure is better correlated with actual subsequent market returns than nearly any alternative, as Warren Buffett also observed in a 2001 Fortune interview. So if one wishes to use the 2000 bubble peak as an objective, we suggest that it would take another 15% market advance to match that highest valuation extreme in history – a point that was predictably followed by a decade of negative returns for the S&P 500, averaging a nominal total return, including dividends, of just 3.7% annually in the more than 14 years since that peak, and even then only because valuations have again approached those previous bubble extremes. The blue line on the chart below shows market cap / GDP on an inverted left (log) scale, the red line shows the actual subsequent 10-year annual nominal total return of the S&P 500.
been willing to hold them in search of any near-term return greater than zero. What is actually true is that even an additional year of zero interest rates beyond present expectations would only be worth a roughly 4% bump to market valuations. Given the current perceptions of investors, the Federal Reserve can certainly postpone the collapse of this bubble, but only by making the eventual outcome that much worse. Remember how these things unwound after 1929 (even before the add-on policy mistakes that created the Depression), 1972, 1987, 2000 and 2007 – all market peaks that uniquely shared the same extreme overvalued, overbought, overbullish syndromes that have been sustained even longer in the present half-cycle. These speculative episodes don’t unwind slowly once risk perceptions change. The shift in risk perceptions is often accompanied by deteriorating market internals and widening credit spreads slightly before the major indices are in full retreat, but not always. Sometimes the shift comes in response to an unexpected shock, and other times for no apparent reason at all. Ultimately though, investors treat risky assets as risky assets. At that point, investors become increasingly eager to hold truly risk-free securities regardless of their yield. That’s when the music stops. At that point, there is suddenly no bidder left for risky and overvalued securities anywhere near prevailing levels. History suggests that when that moment comes, the first losses come quickly. Many trend-followers who promised themselves to sell on the “break” suddenly can’t imagine selling the market 10-20% below its high, especially after a long bull market where every dip was a buying opportunity. This is why many investors who think they can get out actually don’t get out. Still, some do sell, and when those trend-following sell signals occur at widely-followed threshholds (as they did in 1987), the follow-through can be swift. Dominant Social Theme: Obama doesn't hate business. He's all about "tough love." Free-Market Analysis: Our perception has changed. Once this article would have made a kind of sense to us (long ago). But it surely doesn't now. It's jam-packed with various sorts of financially illiterate assumptions. Sorry for picking on it; there are hundreds if not thousands of articles published every day that are built on the same foundation. The author is Jared Bernstein, former chief economist for US Vice President Biden and the author of a book called Crunch: Why Do I Feel So Squeezed? ... Before getting into the metrics, let's be clear: I'm not arguing that businesses do or should love everything Obama has done ... I'm asking the much more direct question: has the Obama presidency been bad for businesses' bottom line? No. Actually, hell no. In fact, with annual data all the way back to 1929, corporate profitability as a share of national income was higher in 2013 than any other year on record. Think about that for a minute. This meme is out there—the fact that the Economist insouciantly throws it out tells you I'm not making this up, and by this widely accepted measure, businesses just had their best year ever. But that's before tax. Did the mean old president whack them on the tax side? Nope. That same all-time record holds for after-tax profits. ... OK, but what about the stock market? Well, the economic recovery that started under Obama in the second half of 2009 is now five years old. Over that period, adjusting for inflation, the S&P 500 has doubled in value. ... The business sector, writ large (we're talking averages here; these statistics don't describe every business' experience), has not only recovered ahead of the middle-class, but it has also surpassed their pre-recession levels of profitability and its pre-Great-Depression historical levels. Relatedly, the stock market, 80 percent of which is held by the richest 10 percent of households, has doubled. Real median income, on the other hand, like many workers' paychecks, are still climbing out of the hole. Neither is it incidental that the hole was dug (in part) by a reckless financial sector, a sub-group within the corporate sector that not only got bailed out by government, but is doing particularly well on the metrics posted above. Did the president say mean things about banks back then? No question. I worked for the White House in those days and I vividly recall how angry the president got when he was told about post-crash, post-bailout bonuses being handed out at AIG. To which I'd say: if you're president and that doesn't piss you off, you're not paying attention. ... Like most people, I don't want a president who harbors deep emotional love or antipathy toward businesses. I couldn't care less if he or she woos them with sweet talk. That's all a distraction. I want a president who understands the role of the business sector in creating growth, American jobs, tax revenues, and of course, profits. And not just profits that slosh about at the top, but incomes that reach the bottom. How do we create that business climate? Now there's the economic policy discussion we need to have. Bernstein ends with the idea that "we" can create a business climate. Nonsense. Markets and competition "create" a business climate. And, honestly, business doesn't need a climate anyway. It's not a plant. It's human action operating individually and in groups. Business simply needs to be let alone. Increasingly, in the US and the West, business is taxed and regulated in ways that often cause enterprises to fail. The author believes corporate profitability is a bellwether of business health. But as we have learned, corporations are not part of the market's normal functionality. They are the creatures of judicial decisions. Corporate personhood has allowed elite interests to develop these vast and sprawling entities that have little or no resemblance to what business would look like without the unmitigated force of the state. Corporations may or may not be doing well, but to use them as a barometer of an overall business climate doesn't make much sense. They are a product of Leviathan not competition. The author claims that Obama is pro-business because he hasn't attacked corporations with higher taxes. Again, so what? These titanic entities would not exist in a normal – non-political – business environment. Taxes have nothing to do with it. He makes the point that the stock market has doubled under Obama's watch, even adjusted for inflation. In fact, the marketplace has been stuffed like a Thanksgiving turkey with literally trillions of Federal Reserve notes printed from nothing. We've speculated the whole point of Fed money printing was to elevate the stock market prior to a great crash that will ease the way for a more globalist monetary system. He does have the grace – or honesty – to admit that employment is not rising aggressively. But in making this observation, he leaves the impression that employment should lift off as the "economy" improves. But there is no market "economy" ... not at this juncture in the life of this republic. It's a controlled economy and any employment expansion must be seen within this frame of reference. Soon enough, this puffed up environment will collapse once more, with a goodly portion of whatever jobs it's been able to "create." Finally, the author admits that the president said "mean things" about banks – but with provocation. Banks were still handing out big bonuses even as insolvency loomed around them. This entirely misses the point. He is making the case that the real issue involving banks has to do with an abnormal level of greed. This feeds the meme that government regulation must be actively enforced to restrain greed. The problems that Western economies face regarding banks have nothing to do with greed. Banks are so big because they are not exposed to competition. The Invisible Hand has been suspended when it comes to banks and almost every other part of the US economy – and Western economies generally. Bernstein's defense of Obama as a pro-business president is flawed. Today, there is precious little left in terms of a genuine marketplace in either the US or the West. Within this context, Obama cannot be seen as a pro-business president, nor can many of his predecessors, either. Obama is a corporatist president, sympathetic – as are so many others in government – to Leviathan. Unfortunately, our modern sociopolitical and economic rhetoric has become so debased that it is difficult even to express in simple language how much has gone wrong. Goldman Goes Schizo On Gold: Boosts Price Target To $1200 Even As It Is "Selling It With Conviction"
Back in the beginning of 2014, Goldman loudly predicted that 2014 would be the year of normalization: the economy would grow by 3%, the S&P 500 would barely rise to 1900, and gold would tumble to $1066. By now it goes without saying that it has been dead wrong about the first with the economy set for a contraction in the first half of 2014 and the full year assured to have the worst GDP growth since Lehman, wrong about the second with the market now so clearly disconnected from any economic fundamentals nobody even pretends that it is anything but the Fed manipulating a rigged stock market, and has been painfully wrong about the third. So with less than 6 months to go until the end of the year, with various gold ETFs suddenly seeing the biggest buying in years, and with gold continuing to outperform most asset classes YTD, what is Goldman to do? Why follow the trend of course, and just like David Kostin had no choice but to boost his S&P 500 price target using the idiotic Fed model as a basis, so earlier today Goldman just upgraded its gold price target from $1,066 to $1,200. Probably this means that after accumulating it for the first half of the year, Goldman is finally preparing to sell the precious metal. Not so fast: because while Goldman did just raised its price target, it continues to have a Conviction Sell rating on Gold, which is its second most hated commodity after iron ore. Go figure. So without further ado, here is Goldman going full schizo. Conviction views: Bearish on iron ore, gold and copper, bullish on nickel, zinc, aluminium and palladium. In gold, we raise our LT price forecasts to $1,200/oz in $2014 terms from $1,066 earlier. Over long time horizons, the gold price has been relatively stable in real terms, keeping pace with inflation. Accordingly we use a flat real gold price forecast assuming gold is an effective inflation hedge and increase in nominal gold prices should offset the impact from inflation. We believe iron ore (-21%), gold (-20%) and copper (-12%) are the mining commodities with the greatest downside on a 12-month view. We have updated our long-term real gold price forecast to $1,200/oz in $2014 terms (was $1,066/oz) to make it more in-line with our marginal cost support level, see Exhibit 66. Currently gold is trading at a 9% premium to our LT real (inflation-adjusted) forecast but we believe on a long-term basis the price should revert back to the cost support level in-line with our estimates. In our view, the 90th percentile of all-in sustaining costs (defined as total by-product cash cost plus royalty expense, plus sustaining capex, exploration and corporate expenses) provides a good estimate of the floor price for gold, as it is the breakeven level for the marginal producer. At times of extreme declines in demand, it is possible for prices to fall below the marginal cost support level; however we believe such events are generally shortlived. Exhibit 67 shows our latest 2014 gold’s all-in sustaining cost curve. Over long time horizons, the real gold price has been relatively stable, keeping pace with inflation. Exhibit 68 illustrates that the real price of gold was fairly constant until the early 1970s, after which it became highly volatile. Although the real price has experienced significant volatility post the 1970s, we highlight its tendency to a mean reversion trend. The real gold price fell back to the 1950s level in 2001 after peaking in 1980, and it is currently in decline again after peaking in 2011. Where things get downright bizarre is the last paragraph where either Goldman had a humongous typo or merely pulled the boilerplate language from a prior report where for some inexplicable reason Goldman says it has a "$1050" price target even as the table above clearly says $1,200. Oh who cares: this whole report is merely for the benefit of Goldman's prop desk, which is clearly ramping up trading, to do the opposite of whatever Goldman's few remaining clients are doing. We expect gold prices to drop to $1,050/oz by the end of 2014, maintaining our previous forecast. Acceleration in the US economic recovery story remains the key driver behind our lower gold price forecast. While weak economic data due to cold weather and the onset of the Crimea crisis led to a sharp rally in gold prices between January and mid-March, sequentially better US activity and easing tensions pushed gold prices lower by early April. Since then, US economic releases have continued to point to acceleration in growth while tensions in Ukraine have escalated, keeping gold prices range bound near $1,300/toz. That said, can Goldman please also advise if its suddenly very active prop group is buying or selling gold. We promise to do whatever they are doing. An early draft of the Transatlantic Trade and Investment Partnership (TTIP) sparked an intensive public debate over possible advantages and disadvantages. This column reviews some arguments in favour of the Partnership and against it. While there is some debate over how large the economic benefit could be in the face of already relatively low trade barriers, critics claim that the deal will lower standards of consumer protection, provision of public services, and environmental protection in the EU. 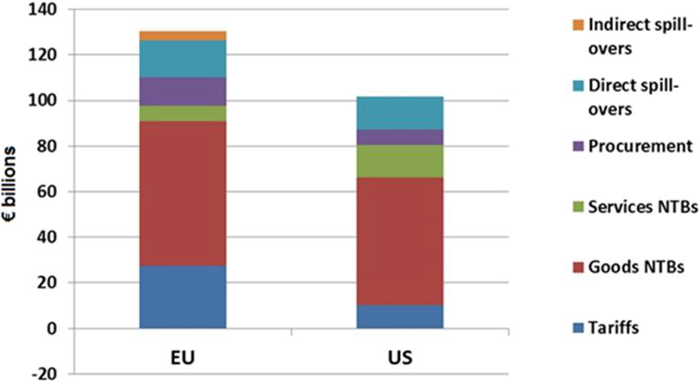 A study by the Centre for Economic Policy Research (CEPR 2013) for the European Commission models the effects of the Transatlantic Trade and Investment Partnership (TTIP) in a computable general equilibrium model. An ambitious deal, consisting of tariff barriers being lowered to zero, non-tariff barriers lowered by 25%, and public procurement barriers reduced by 50%, would lead to an increase in EU GDP by 0.5% by 2027. Growth effects for the rest of the world will be positive, on average, 0.14% of GDP due to increased demand from the EU and US. Because of different compositions of trade, particularly low income countries will not be negatively affected by the TTIP. Another, less frequently cited study by the Bertelsmann Foundation (2013) finds larger long-term GDP per capita effects of 5% for the EU and 13.4% for the US as a result of dismantling all tariff and non-tariff barriers. Here, gains would largely come at the expense of third countries. For Canada and Mexico, whose free trade agreements with the US would lose value, TTIP would in the long run imply a 9.5% and 7.2% decrease in GDP per capita over the baseline scenario. The EU Trade Commissioner Karel de Gucht (2014a), citing the CEPR numbers, writes that TTIP offers significant benefits to the EU and the US over ten years during times of hesitant economic recovery. As shared values will facilitate negotiations, results should be reached in three dimensions: Market access, regulatory cooperation, and trade rules. Improved market access will benefit European companies and consumers alike. Standardisation in regulation would avoid unnecessary costs for global producers. Dean Baker (2014a) argues that calls to support TTIP for its beneficial impact on jobs and growth are lies: The CEPR model assumes full employment anyway, and a GDP raise of only 0.5% over 13 years will not have a discernible impact on employment. Growth effects may in fact even go in the opposite direction — stronger patent and copyright protections may result in higher prices for goods. Gabriel Siles-Brügge and Ferdi De Ville (2013) challenge the proclaimed benefits of this much-vaunted deal. Most of the economic benefit outlined in the CEPR study is due to the dismantlement of non-tariff barriers. Yet, the Commission has itself pointed out that only 50% of non-tariff barriers are at all ‘actionable’, i.e. within the reach of policy. Eliminating half of these, as assumed by the CEPR, seems already highly ambitious. Furthermore, due to strong inter-sector linkages, these benefits will only materialise if liberalisation is successful in all sectors. Pascal Lamy (2014) writes that preferential trade agreements (PTAs), such as TTIP, could be very beneficial if they helped to bring down remaining tariff barriers. However, most PTAs focus more on regulatory issues than tariffs. Some non-tariff barriers, such as consumer protection, serve legitimate objectives. And there exists a risk that PTAs may lock various groups into different regulatory approaches, increasing transaction costs. In the end, a functional multilateral trade system through the WTO remains vital to avoid economic fragmentation and set globally sensible rules. Michael Boskin (2013) points out that the TTIP may have consequences that extend beyond the US and the EU. After NAFTA was signed, the Uruguay round of trade talks was revived. Similarly, a successful TTIP may be a major impetus for rekindling the moribund Doha Round. It will be of great importance whether compromises can be found in the truly contentious issues between the EU and the US. One of the most difficult is the EU’s limitation of imports of genetically modified foods, which presents a major problem for US agriculture. Another is financial regulation, with US banks preferring EU rules to the more stringent framework emerging at home. This is of interest to countries outside the deal, too; if the EU relaxed its rules on genetically modified food imports and translated this with careful monitoring to imports from Africa, this could be a tremendous boon to African agriculture. Hans-Werner Sinn (2014) is not surprised that bilateral trade agreements have been lately gaining traction globally, as there is no real progress on multilateral trade negotiations. The Doha round of WTO talks basically was a flop. Currently, fear of negative effects on consumer protection in the EU is distorting the debate. In reality, consumer protection standards in the US are often much higher than in the EU where, following the Cassis de Dijon ruling of the European Court of Justice, the minimum standard applicable to all countries is set by the country with the lowest standards. TTIP could bring significant economic benefits while scrapping some misguided EU regulations, such as the capping of CO2 emissions on cars, which is a covert industrial policy aimed at protecting Italian and French manufacturers of smaller cars. Paul Krugman (2014) writes that if the Trans-Pacific Partnership (TPP) agreement of the US with 11 countries throughout the Asia-Pacific region were to fail, it wouldn’t be a major disaster. Real trade barriers – tariffs – already are pretty low. The International Trade Commission in their latest report put the cost of American import restraints at 0.01% of GDP. What these agreements tend to be really about are issues such as intellectual property rights – with far less certain advantages. Intellectual property rights create temporary monopolies. These may be necessary to spur innovation but are not connected to classical arguments in favour of free trade. Ryan Avent (2014) thinks that Krugman hasn’t done his homework on this issue. Firstly, tariffs are not universally low. Even if the macroeconomic impact may be limited, reducing high tariffs on some goods would be microeconomically desirable. Secondly, one of the ambitions of both TPP and TTIP is the reduction in non-tariff barriers. In most cases, such as agricultural imports, these barriers are much costlier than tariff barriers. Dean Baker (2014b) is highly sceptical of the usefulness of increased protection of intellectual property: The possibility of silly patents such as one on a peanut butter sandwich in the US only raises prices and impedes competition. The big winner may be the pharmaceutical industry, which may extend the unchecked patent monopolies it enjoys in the US to the EU, resulting in higher drug prices and lower quality healthcare. Other companies see TTIP as a way of promoting their particular interests, for example, by being able to use free trade arguments to circumvent the democratic process on issues such as fracking. Investment protection – a threat to national sovereignty? TTIP is not about the interests of the US dominating those of the EU, but of the interests of capital owners prevailing over those of ordinary citizens, writes Jens Jessen (2014). Investor protection clauses in TTIP would be a vast threat to national policies on culture and education — public universities could no longer be supported to be more affordable than private ones. Support to a local film industry would be impossible as big companies would have the same rights to subsidies. Production companies for popular entertainment could sue states to extend to them their support for local operas and symphony orchestras, and public radio stations would be under threat as well. Karel de Gucht (2014b) sharply retorts that these allegations are unfounded — the EU treaties and the UNESCO convention on cultural diversity require member states to protect cultural diversity and explicitly permit schemes such as support to local film industries, whereas audio-visual services are not at all in the scope of TTIP anyway. Investment protection treaties, of which Germany alone has signed 130, have never included compensation rights for firms in case of profit reductions. And after Poland signed an investment protection treaty with the US in the early 1990s, its right to offer subsidies in the sector of culture or education was never called into question. The investment chapter in TTIP is less of a threat to EU and US democracy than often alleged, writes Robert Basedow (2014). Critics claim that investor-state dispute settlement clauses will allow investors to sue states before supranational arbitrational tribunals for the annulment of social, health or environmental protection laws. However, due to the existence of a multiplicity of bilateral treaties with financial hubs like Hong Kong or Singapore, investors with holdings in these jurisdictions already have this right today. Indeed, TTIP offers the chance to make such arbitration proceedings more transparent and legitimate. Dominant Social Theme: The dollar is going down. An unavoidable tragedy. Free-Market Analysis: This pernicious elite meme amply illustrates what we call directed history. In this case endless articles are appearing to explain why the dollar is in terminal decline as the BRICS (including South Africa) are ascending. We made a number of points about the reality of the BRICS emergence and how when one examines the reality of the global economic system a good many questions emerge. Skepticism is advised. The new BRICs Development Bank, modelled on the IMF, will have a $100bn currency reserve available to lend around the world, giving distressed debtor nations an alternative to the "Washington consensus". For a long time, the BRICs have been paying in to the IMF, yet been denied additional influence over what happens to the money. Belgium has more votes than Brazil, Canada more than China. The institutions governing the global economy have failed to keep pace with reality. Modest reforms giving the large emerging markets more power, agreed with much fanfare in 2007 and again in 2010, have been stalled by Washington lawmakers. The BRICs have now called time, setting up their own, rival institution based in Shanghai. The dollar's status is a big question. Judging the outcome is more akin to star-gazing than scientific economics. But the establishment of this BRIC Development bank, timed to coincide with the anniversary of Bretton Woods, is an audacious and significant move. The world's emerging giants now have thumbscrews on the West. This is a serious article in a serious paper and the announcement at the end that "the world's emerging giants now have thumbscrews on the West" is a momentous statement. Reading the article, the demise of the dollar seems both evident and inexorable. And yet, having lived through the period that has yielded this conclusion, we are in a position to say with some authority that the end of the dollar is a manipulated occurrence, not an inevitable one. It is directed history, in other words. You have to begin with the nomenclature itself. The name was coined by a banker at Goldman Sachs over ten years ago and eventually gave rise to a rivalry – created to begin with by the mainstream media – between the BRICS and the West. Once the name was applied, it became logical for the four (five really) emergent economic powers to create various economic policies in concert with one another. In reality, there was no reason why Brazil would consult with Russia, or India with Brazil. It only seemed logical because the name predicted the outcome. Take a step back, please, and observe the dialectic. That's how globalist elites work, by creating conflicts that move a given argument or sociopolitical strategy forward. Sometimes the dialectic is accomplished via a war. Other times, it is created via supposed economic necessity. Although the dollar's reserve status won't end overnight, the global payments system is now moving inexorably towards that outcome. The US currency accounted for just 33pc of all foreign exchange holdings in 2013, on IMF numbers, down from 55pc in 2001. Within a decade or so, a "reserve currency basket" may emerge, with central banks storing wealth in a mix of dollars, yuan, rupee, reals and roubles, as well as precious metals. This is simply too neat. The alternative media has been predicting this outcome for decades, virtually ever since Keynes suggested his globalist bancor after World War II. But now that this "global payment system" is almost a reality, we're supposed to believe it is merely an "inexorable outcome." In the US, the Obama administration is fragmenting the border between the US and Mexico. Waves of immigrants are sweeping into the US as part of what is shaping up to be the seeming deliberate implementation of a North American Union that is eventually supposed to encompass Canada as well. The US stock market is being shoved into the stratosphere in order to create what we call a "Wall Street Party" that will create enormous faux-prosperity before a destined crash. But the crash itself will simply add more impetus to monetary globalism. Out of chaos ... order, in this case an international money-regime. For a decade, this Internet Era has revealed the plans of internationalist bankers in more and more detail. Every significant monetary or military event points the way toward this ongoing consolidation. That's why articles like this one in the Telegraph are so surprising. We can see clearly that the dollar's destabilization was a manipulated event, one that the Bush regime pursued through several regional wars and a plethora of "security" spending as they secured the fundaments of a massively expensive surveillance state. There was nothing natural or inevitable about any of this. The concept of the BRICS was created by Goldman Sachs; its evolution is convenient, even suspicious. The dollar's destabilization was an act of political orchestration as well. And now we are to believe that a "reserve currency basket" is the obvious destination. Conclusion If it is destiny, it is a manipulated one. One way to induce a Pavlovian reflex in mainstream economists is to invoke the expression “free trade”. Conventional wisdom holds that more trade is always better; only Luddites and protectionists are against it. That’s one big reason why the toxic TransPacific Partnership and its evil twin, the Transatlantic Trade and Investment Partnership, have gotten virtually no critical scrutiny, save from more free-thinking economists like Dean Baker. They have been sold as “free trade” deals and no Serious Economist wants to besmirch his reputation by appearing to be opposed to more liberalized trade. “Free trade” boosterism runs two parallel arguments: the “’free trade’ increases wealth and therefore we should all go along” and and the “more open trade is inevitable, you better be on this bus or you will be under the bus.” Too often, these arguments rest on the assumption that coming close to the economists’ fantasy of frictionless ‘free trade’ is better. But that was debunked in 1953, in the Lipsey-Lancaster theorem, which demonstrated that trying to move to closer to an unattainable state was not only not assured to produce better outcomes, it could very well produce worse ones. You actually need to do the work of evaluating various “second best” alternatives, rather than assuming more is better. But even though economists know about Lipsey/Lancaster, they dismiss its inconvenient implications. Moreover, there are other sound critiques of our “more ‘free trade’ is every and always better” regime. William Greider has long pointed out that we do not operate under a free trade regime, but a managed trade system, and virtually all of our trading partners negotiate them from a mercantilist perspective: that they aim to run trade surpluses and protect their workers. Dani Rodrik has described a trilemma: that you can’t simultaneously have deep integration of markets, national sovereignity, and democracy. At least one of them has to give. And we can see in Europe that it is democracy that is being sacrificed. But these criticisms have been treated as fringe phenomena. What is noteworthy, however, that it is suddenly acceptable to question the ‘free trade’ orthodoxy, although the critics take great care to distance themselves from any populist or labor-favoring taint. We took note of one last week, of a hand-wringing piece in that bastion of correct economic thinking, Project Syndicate, in which Ian Goldin lamented that globalization had increased systemic risk on numerous fronts: environmental, financial, political, technological. Goldin wasn’t willing to buck conventional wisdom and use his observation to suggest that “free trade” may have gone past its point of maximum advantage. But the fact that the only solution he could envision was the pipe-dream of better governance was telling. A fresh article, again at Project Syndicate, has the former head of the FSA, Adair Turner, making a more direct, but short of head-on, challenge to “free trade” orthodoxy. Turner’s point is that trade is unlikely to do much to drive further growth, and economists and policymakers have much better focuses for their energies. He also points out that to the extent that further liberalization of trade does increase GDP, it is likely to come at a cost. But there is no reason why trade should grow faster than GDP forever. Indeed, even if there were no trade barriers at all, trade might grow significantly more slowly than GDP in some periods. Several factors make it possible that we are entering such a period. With industrial tariffs already dramatically reduced most potential benefits of trade liberalization have already been grasped. Estimates of the benefits of further trade liberalization are often surprisingly low – no more than a few percentage points of global GDP.. The main reason for slow progress in trade negotiations is not increasing protectionism; it is the fact that further liberalization entails complex trade-offs no longer offset by very large potential benefits. The Doha Round’s failure has been decried as a setback for developing countries. And some liberalization – say, of advanced economies’ cotton imports – would undoubtedly benefit some low-income economies. But full trade liberalization would have a complex impact on the least developed economies, some of which would benefit only if compensated for the loss of the preferential access to advanced-economy markets that they currently enjoy. This implies that further progress in trade liberalization will be slow. But slow progress is a far less important challenge to growth prospects than the debt overhang in developed economies, or infrastructure and educational deficiencies in many developing economies. That reality often goes unacknowledged. The importance of past trade liberalization has left the global policy establishment with a bias toward assuming that further liberalization would bring similar benefits. This is an important argument, which sadly is likely to get little traction: at this stage of economic development, trade deals are largely beside the point. And that reality is perversely acknowledged in the TTP and the TTIP. They are not about “free trade”. They are, in the case of the TTP, to advance US geopolitical aims by isolating China, and in the case of both proposed pacts, to weaken national sovereignity to make the world safer for multinationals. The revolving door payoffs for the members of the US Trade Representative’s office must be really juicy for them to be so eager to engage in treason. 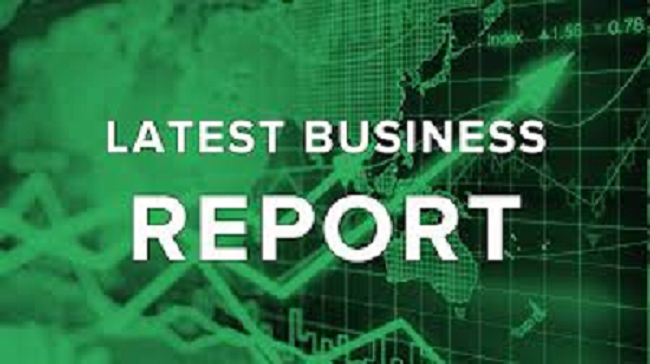 The Daily Business Report features the most significant news about money, markets and commerce. © 2000-2019 by BATR All Rights Reserved. Awesome Inc. theme. Powered by Blogger.